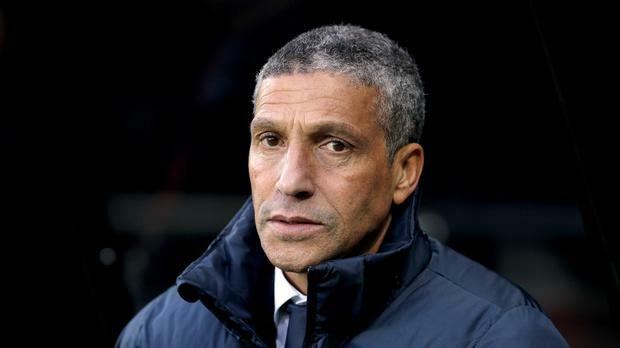 Chris Hughton has warned Brighton not to look over their shoulders at the chasing pack as they attempt to cement their place in the Premier League. The Seagulls took their points tally to 22 from 21 games - four points clear of the drop zone - after a dour 0-0 draw at Newcastle, with whom they emerged from the Sky Bet Championship last season. However, with Bournemouth and Swansea both winning to boost their survival hopes, Hughton knows his side can take nothing for granted. He said: "What generally tends to happen is the mainstays of this division who haven't had a great first half of the season generally get stronger as the season goes on. "Everton got away a little while ago, but your West Hams are down the bottom and you always expect that they're going to get away. "What you have to be able to do is look after your own results because if you continue to look at other results, then you'll end up being disappointed most weeks." Brighton might have headed back from Tyneside with all three points had Magpies goalkeeper Karl Darlow not managed to parry Lewis Dunk's header, although opposite number Matt Ryan had to be equally alert to deny Dwight Gayle at the other end with the visitors enjoying marginally the better of the game. Hughton said: "I think we were the better side over the 90 minutes. It could have been three points, so we're disappointed at that. "But also, these are a good side irrespective of anything and a worse feeling would have been coming away from here with maybe the one good chance that they had (being taken) and we come away with a defeat. That would have been the worst feeling because we certainly wouldn't have deserved that." It proved to be another difficult afternoon for Newcastle boss Rafael Benitez, who restored the players he rested for Wednesday night's 1-0 defeat by Manchester City to the starting line-up, but saw his team labour in a game they had targeted. "For us, it was important to win, but if you cannot win, always it's important that you are strong in defence and you do not give them too many chances," the Spaniard said. "I don't think they had too many, apart from set-pieces - we were expecting that they could be strong at set-pieces, but still they had maybe one and the rest of the game, without playing well, their keeper was busier than our keeper." With no sign of a proposed takeover being completed at any time soon, the Magpies remain in a state of flux, and Benitez will head for Stoke on Monday with his side having been booed by a section of their support on the final whistle. He said: "After a game that you are expected to win, it can be disappointing, but at the same time, these fans appreciate that the effort of the players is there, so you cannot complain about that."